New Century Resources has executed the first long-term offtake agreement for zinc concentrate produced at the Century zinc mine in Queensland. The Perth-based company is on track to restart the historic mine later this year, more than two years after it was officially shut due to low zinc prices by previous owner, MMG. New Century expects the Century mine to be one of the world’s top 10 producers of zinc once operations are ramped up. The offtake agreements, with Mercuria Energy Trading and Transamine Trading SA, reflect the strong zinc market fundamentals and current scarcity in global supply of large tonnage zinc concentrate offtake available, according to the company. New Century launched a tender for 1.5 million tonnes (Mt) of zinc concentrate over the first 3.5 years of production during the December 2017 quarter. The offtake agreements with Mercuria and Transamine cover around half of this total. Patrick Walta, New Century managing director, said the execution of these initial offtake agreements represented another milestone for the company as its progressed towards production in the third quarter 2018. 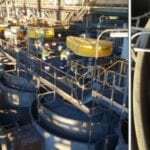 “New Century is very pleased with the strong demand shown by smelters and commodity traders in its tender process, which is a clear demonstration of the quality of New Century’s concentrate and the current strong fundamentals of the zinc market,” Walta said. New Century added it was progressing discussions with other potential buyers of zinc concentrate from the Century mine. Meanwhile, New Century has received a request for arbitration concerning a claim by Nyrstar Sales and Marketing regarding the purchase of zinc concentrate from the mine under historical commercial agreements. The company understands the agreements were executed in 2007, but were also terminated “some time ago and prior to the company acquisition of the mine” in 2016. “New Century was not aware of the existence of any such agreements with Nyrstar when it acquired its interest in the Century zinc mine and copies of these agreements were not provided to the company at the time of the acquisition,” New Century said in an ASX statement.